While shopping at the grocery store, I noticed that the bags in the meat department had some blue writing on them. Naturally being curious, I walked over and pulled the roll down a bit to see what was written on the bag. to keep in mind is that you need to have coals to cook your meal. There are many options on what to cook with a tin foil dinner. Some of my favorites are fajitas, stir-fry, and good old Scouter Hash. To save on cooking time, precook your meal at home and wrap in the tin foil. When you reach camp, and the coals are ready, you will be the first one eating while the others are waiting an hour for their hash to cook. Start fire, wait for coals, place with meat side down first on coals, turn over after you hear sizzling for 2 minutes, let cook for another 5-10 minutes, remove with tongs and enjoy. Review with your counselor the injuries that might arise from cooking, including burns and scalds, and the proper treatment. Describe how meat, fish, chicken, eggs, dairy products, and fresh vegetables should be stored, transported, and properly prepared for cooking. Give your counselor examples from each food group. Describe for your counselor the measurements of servings for each food group. Describe to your counselor food preparation techniques that result in more healthful and nutritious meals. A camp dinner with soup; meat, fish, poultry, or an appropriate substitute; two fresh vegetables; drink; and dessert. All are to be properly prepared. When preparing your menu, follow the nutritional guidelines set by the food pyramid. A one-pot dinner. Use foods other than canned. Using the menu planned for requirement 3, make a food list showing cost and amount needed to feed three or more boys. List the utensils needed to cook and serve these meals. For each meal prepared in requirement 4a, use safe food-handling practices. Dispose of garbage, cans, foil, paper, and other rubbish by packing them out and depositing them in a proper container. After each meal, clean up the site thoroughly. A breakfast, lunch, and dinner for a trail or backpacking trip where light weight is important. You should be able to store all foods used for several days without refrigeration. When preparing your menu, follow the nutritional guidelines set by the food pyramid. Using the menu planned for requirement 5, make a food list showing cost and amount needed to feed three or more boys. Figure the weight of the foods in requirement 5a. Use an approved trail stove (with proper supervision) or charcoal to prepare your meals. For each meal prepared in requirement 6a, use safe food-handling practices. Dispose of garbage, cans, foil, paper, and other rubbish by packing them out and depositing them in a proper container. After each meal, clean up the site thoroughly. Plan a menu for three full days of meals (breakfast, lunch, and dinner) to be cooked at home. When preparing your menu, follow the nutritional guidelines set by the food pyramid. All meals are to be cooked or properly prepared. Using the menu planned for requirement 7, make a food list showing cost and amount needed to feed yourself and at least one adult (parent, family member, guardian, or other responsible adult). Tell what utensils were needed to cook and serve these meals. Prepare and serve a breakfast, lunch, and dinner from the menu you planned for requirement 7. Time your cooking to have each course ready to serve at the proper time. Have an adult verify the preparation of the meal to your counselor. Find out about three career opportunities in cooking. Pick one and find out the education, training, and experience required for this profession. Discuss this with your counselor, and explain why this profession might interest you. * The meals in requirements 4a and 6a may be prepared for different trips. They need not be prepared consecutively. 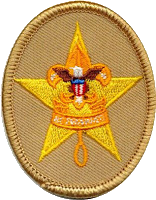 Scouts working on this badge in summer camp should plan around food they can get at the camp commissary.